Heating Solution Update… and Drama! We have had some cold days on and off and are now experiencing several straight days of cold weather. The clay pot heater isn’t working as well as expected. It has been keeping the greenhouse about 5 degrees warmer than the outside temperature, but this isn’t going to help once it drops below freezing for extended periods of time. I noticed the pot was warm to the touch, but not burning. I then realised the inside pot was much larger than what other people have used so I replaced it with a much smaller pot thinking this would free up more heat, but not so much. I am beginning to think that perhaps I should do away with the inside pot all together. Most people I have been following are using this type of heater in a small room and one that is most likely insulated to some extent. Since the greenhouse is not insulated the cold must lessen the ability of the clay to hold the heat so perhaps if I use a single pot it would get hotter? Currently I have placed the original interior pot on some bricks with another set of candles right next to the first clay pot heater so to raise the temperature of the greenhouse. Tonight the low is supposed to be -6 c / 21 f. I am hoping this helps because I cannot use the electric heater. In other news, I present to you… Drama. 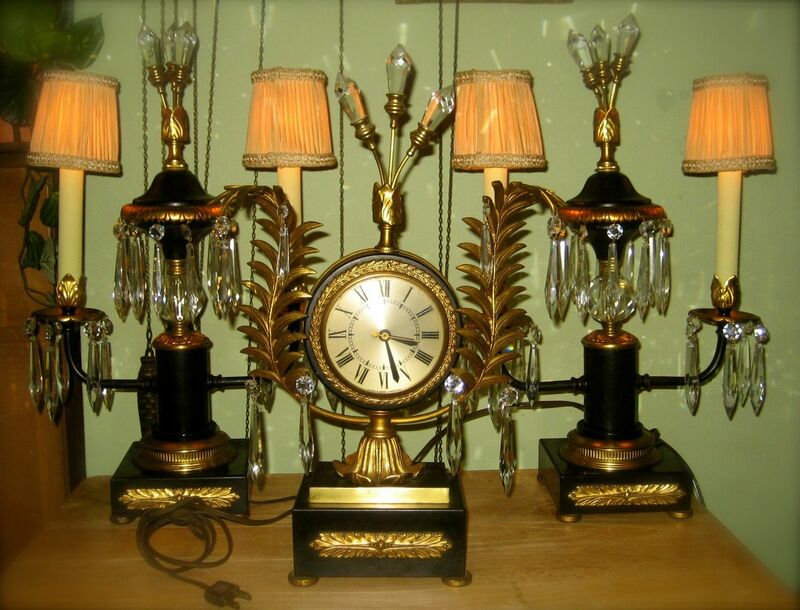 Vintage Art Deco mantel clock set. Ever since the dining room redo I have felt the need for something magnificent for the mantle and everything I have just won’t cut it. Then I discovered these on eBay… and now they are mine! I know, I know, they are somewhat over the top, but at least I didn’t go for the Baroque of gilded putti, flitting in the clouds with bow and arrow. These are more subtle. Okay, perhaps subtle isn’t the correct word for these, but you know what I mean! I think, in the right context, which happens to be the mantle in my dining room they will be perfect. An update to this gilded drama will follow once they arrive and are arranged.